The Acanto leaf has always been a source of artistic inspiration: from the depictions on the Corinthian capitals to the ancient ornaments on masters’ garments. In the Acanto sham, this plant’s leaves are masterly woven and entwined with flowers that soften its appearance. The motif’s harmony is embellished by the 500 t.c. yarn-dyed jacquard that makes this collection perfect for those who love to have character in their home. Available in Standard, Euro and King sizes, the Acanto Shams have four flanges of 2 inches neatly finished with a simple hem. Made in Italy. The Acanto leaf has always been a source of artistic inspiration: from the depictions on the Corinthian capitals to the ancient ornaments on masters’ garments. In the Acanto sham, this plant’s leaves are masterly woven and entwined with flowers that soften its appearance. The motif’s harmony is embellished by the 500 t.c. yarn-dyed jacquard that makes this collection perfect for those who love to have character in their home. Available in Standard, Euro and King sizes, the Acanto Shams have four flanges of 2 inches neatly finished with a simple hem. Made in Italy. The Acanto leaf has always been a source of artistic inspiration: from the depictions on the Corinthian capitals to the ancient ornaments on masters’ garments. In the Acanto duevt cover, this plant’s leaves are masterly woven and entwined with flowers that soften its appearance. 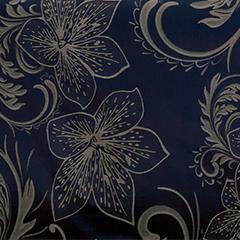 The motif’s harmony is embellished by the 500 t.c. yarn-dyed jacquard that makes this collection perfect for those who love to have character in their home. 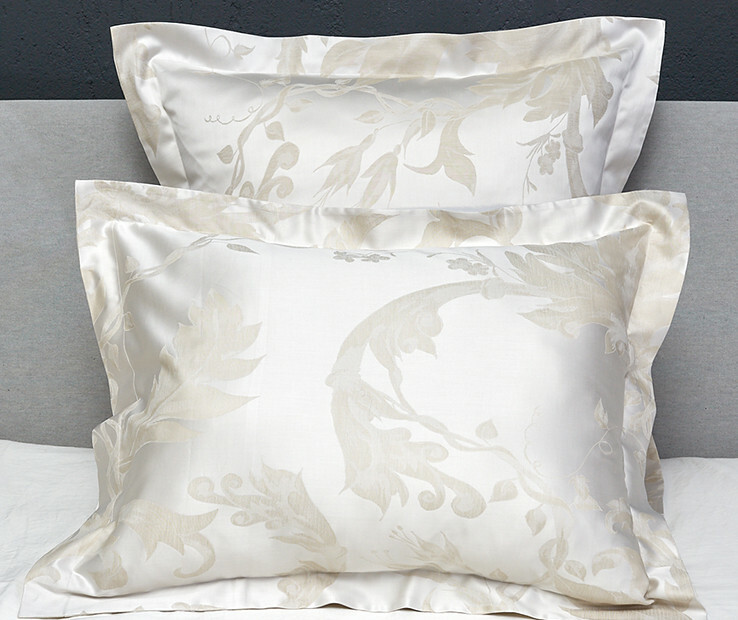 Available in Twin, Queen and King sizes, the Acanto Duvet cover is backed with silky cotton sateen in coordinating color and is neatly finished with a simple hem, buttons closure. Made in Italy. 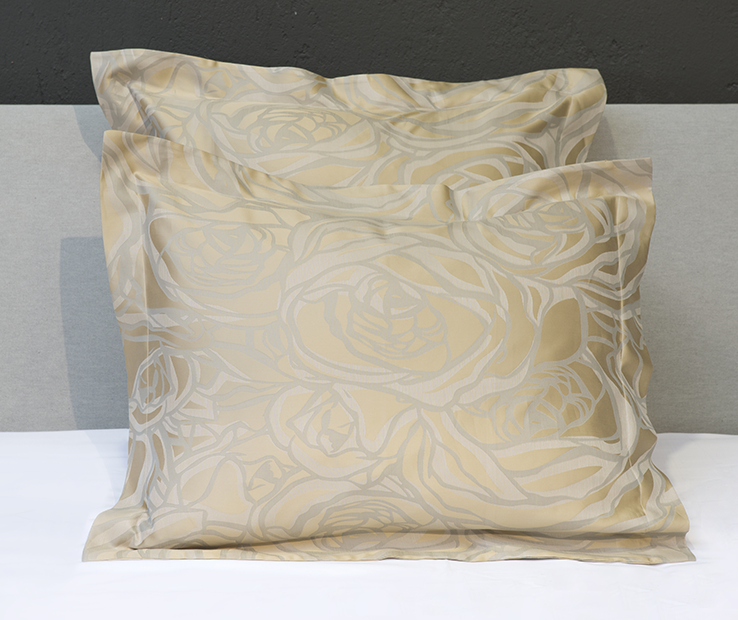 The Roseto sham reinterprets the classic rose motif with a contemporary style. Thanks to its classic and modern blend, this collection coordinates with any type of décor. 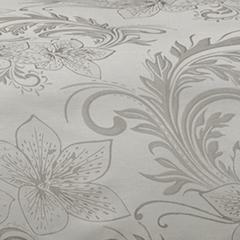 The brightness and preciousness of the yarn-dyed jacquard 500 t.c., entirely woven in Italy, embellish the product allowing this line to be a very elegant element of the décor. 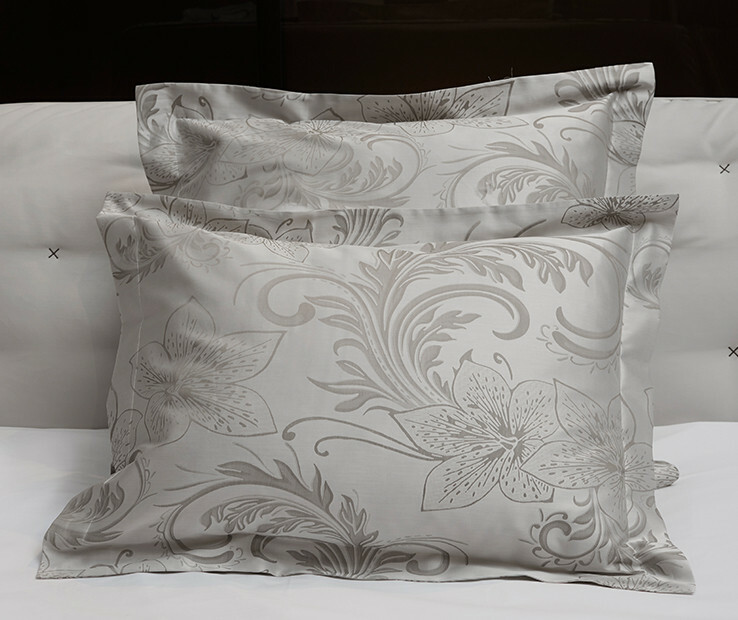 Available in Standard, Euro and King sizes, the Roseto shams have four flanges of 2 inches neatly finished with a simple hem. Made in Italy.